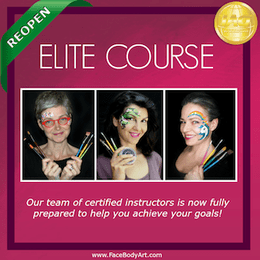 Enroll in Elite Course Today and Begin Your Studies Next Month! Attention: Limited number of spots available! 1095 EUR: Pay in full today! The buyer may request a 100% money-back refund for both the Professional or Elite Course during the first 90 days from the beginning of their studies. The refund will be made in the case where the buyer was not satisfied with the results achieved after completing the entire educational program: done all homework, passed all evaluation tests and painted all designs included in the Course. Once a valid refund request has been submitted, the refund process will take no more than 10 days. The buyer gets lifetime access to Course content and all its future updates, to the School Private Group and to Webinars. The buyer can study the Course content at their own pace, take breaks whenever needed and get back to the studies whenever they choose. Additional individual feedback option with a School tutor (Elite Course) is limited to one year from the first day of study.